The Bureau of Indian Affairs (BIA) issued a solicitation, using simplified acquisition procedures, to supply diesel fuel to a Navajo District school (Mariano Lake Community School). The procurement was set aside for Indian small business economic enterprises (ISBEE). When the Government uses simplified acquisition procedures, it is not required to use full and open competition to conduct the procurement. Instead, the Government is required to promote competition to the maximum extent practicable. Typically, this means posting the notice in a public place at the contracting office for at least 10 days. Beyond that, the Government must also conduct the procurement consistent with a concern for fair and equitable competition. So, for example, a contracting officer cannot solicit one source and fail to properly post a notification. Due to the urgent nature of the diesel fuel, the contracting officer sent the solicitation to three identified eligible firms on Saturday with a proposal due date the following Monday. The contracting officer also placed a copy of the solicitation in a three-ring binder kept at the reception desk in the contracting office. By Monday, two bids were received and award was made to the lowest bidder. Bluehorse Corporation found out about the solicitation six days after the contract had been awarded and filed a Comptroller General (CG) bid protest. Bluehorse argued that the contracting officer had failed to publicize the requirement properly, which effectively excluded it from competition. The CG sustained the protest. The CG ruled that BIA's actions fell short of the minimum standards for obtaining maximum practicable competition when using simplified acquisition procedures with respect to both publication of the requirements and soliciting sources. "We do not regard the Saturday placement of the solicitation in a binder, in an office that was effectively closed to the public on a weekend for quotations that were due by 2 p.m. on Monday, as meeting the requirement for public posting. Further, the contracting officer's decision to contact one source that was plainly unlikely to supply diesel fuel, leaving only two sources that could, does not meet the guideline of soliciting at least three sources to promote competition to the maximum extent practicable." BIA was instructed to re-solicit the requirement and pay Bluehorse reasonable costs for filing and pursuing its protest (including reasonable attorney fees). ALERT: The U.S. Department of Labor's (DOL) new overtime rules become effective in just over a month from now; December 1, 2016. These new rules will make 4.2 million employees previously exempt from overtime, eligible for overtime pay. Under current overtime rules, employees who meet the criteria for the Executive, Administrative, and Professional (EAP) white-collar exemptions and earn more than $455 per week ($23,660 per year) are exempt from overtime protections of the FLSA (Fair Labor Standards Act). On December 1, 2016, this threshold doubles to $913 per week ($47,476 per year). Currently, there are 22,5 million workers that are overtime exempt. On December 1, 2016, 4.2 million of these workers will get new overtime protections (or get a pay raise to the new threshold). In some cases, it may be more cost effective to increase salaries to the new threshold than to pay overtime. Contractors should perform that kind of analysis. Women will benefit more than men. That 4.2 million employees that will become eligible for overtime breaks down to 2.3 million women and 1.9 million men. Miscalculating overtime pay can result in penalties under the FLSA (and possible State laws). These penalties are not insignificant and will also consume a lot of your time and energy. Generally, employees can be expected to know their rights. The Department of Labor's Wage and Hour Division collects $120 million every year in back wages owed to employees for overtime violations. In many cases, these recoveries were initiated when employees filed complaints with the Department of Labor. You can read more about the new overtime rules here. Yesterday, we wrote about the federal judge in Texas that issued a temporary injunction halting the implementation of the new Fair Pay and Safe Workplaces (FPSW) regulations (see Federal Court Issues Preliminary Injunction Blocking Most of Fair Pay and Safe Workplace Provisions). Indeed this was a great victory for Government contractors but already, contractors (and prospective contractors) are being cautioned that its too early to take a victory lap. There is a strong potential for an appeal or perhaps amended regulations that address the Judge's concerns. A Justice Department spokesperson was quoted as saying that lawyers are studying the decision and "considering their options". Additionally, a spokesperson from the Labor Department defended the rules and said that the administration is confident they will be upheld in the courts. The cost of regulations is not free and the cost for the FPSW regulations is huge. The Regulatory Impact Analysis (RIA) calculated costs of $458 million imposed on contractors and subcontractors and nearly $16 million imposed on the Government during the first year of implementation. The cost for the second year of implementation was almost as bad - $414 million for contractors and $10 million for the Government. Even the Judge was taken back by these amounts and ruled that there was insufficient data to accurately assess whether the benefits derived from the new regulations were commensurate with the costs to the contractors. In fact, there is anecdotal evidence that some contractors might withdraw from Government contracting which will reduce competition in the Federal marketplace. One aspect of the decision that we didn't discuss yesterday concerned the FPSW's "paycheck transparency requirement" allowing employees to chat about their paychecks with one another. The court declined to enjoin enforcement of the paycheck provisions. Most employers have no issue with these provisions so the Court's declination is not viewed as very significant. But, appeals work both ways and perhaps this will be appealed somewhere down the road. Because there is a strong potential for appeal or amended rules, contractors and subcontractors should continue planning for eventual compliance. Just before the provisions of the Fair Pay and Safe Workplaces Executive Order were scheduled to become effective, a U.S. District Court (Eastern Texas) issued a preliminary injunction blocking most of the provisions implementing the President's Executive Order (EO) on Fair Pay and Safe Workplaces (FPSW). Most notably, the provision imposing new reporting requirements regarding labor law violations by Government contractors and subcontractors has been suspended. For background on the EO and regulations, see Fair Pay and Safe Workplaces and other discussions linked in that post. The Executive Order, FAR rule, and DOL guidance exceed the President's, FAR Council's and DOL's authority and are otherwise preempted by other federal labor laws. The Executive Order, FAR rule, and DOL guidance violate the due process rights of government contractors and offerors (compelling them to report and defend against non-final agency allegations of labor law violations without being entitled to a hearing at which to contest such allegations). The Executive Order and the FAR Council rule violate the Federal Arbitration Act. The Court ruled that the Plaintiffs (the Association) satisfied the prerequisites for a preliminary injunction, that they have demonstrated a substantial likelihood of success on the merits as to their claims, have shown irreparable harm in the absence of immediate relief, and the public interest supports issuance of an injunction to maintain the status quo of many decades pending a final decision on the merits. Specifically, the Government is enjoined for implementing any portion of the FAR Rule or DOL guidance relating to the new reporting and disclosure requirements regarding labor law violations. The Court also noted that FPSW violated the Administrative Procedures Act (APA) as an arbitrary and capricious action that does not provide an adequate explanation for imposing drastic new requirements, a cumbersome process with the potential of bogging down the already overloaded procurement process, and the significant additional costs and expenses on government contractors without a demonstration that the FPSW will promote economy and efficiency in Government contracting. This cost/benefit disconnect is very obvious to just about everyone. This injunction should please every current and prospective Government contractor. We have yet to find a contractor favoring the FPSW regulations. We discuss fraud, waste, and abuse here on this blog quite a bit as well as the ensuing investigations and punishments. Most of the time, when fraud involves a contractor without a specific tie in to an individual, there is a fine imposed. The determination of the amount of the fine is rarely given although it is almost always significantly less than the maximum fine for the criminal or civil crime. There are guidelines that allow for credit in the calculation of a fine if the organization has in place an effective program to detect and prevent violations of law. Such a program must be one that is reasonably designed, implemented, and enforced so that it generally will be effective in preventing and detecting criminal conduct. A contractor must use due diligence in seeking to prevent and detect criminal conduct by its employees. Use due care not to delegate significant discretionary authority to persons whom the organization knows or should have known had a propensity to engage in illegal activities. After detection of an offence, the organization must take all reasonable steps to respond appropriately to the offense and to prevent further similar offenses, including modifying its program and appropriate discipline for the individuals responsible for the offense and for those who failed to detect it. Fraud, waste, and abuse will always be with us. No system of detecting and preventing it will be perfect. But if a contractor exercises due diligence in prevention and detection activities as enumerated above, it stands a good chance of reduced fines should fraud, waste, and/or abuse come calling. Department of Defense (DoD) contractors are reminded that DFARS (DoD FAR Supplement) 203.1004 requires that the DoD-IG (Inspector General) Hotline Poster be posted in a prominent location if awarded a contract in excess of $5.5 million. Non-DoD contractors have a similar requirement found in FAR 3.1004. Whether contractors have a threshold contract or not, we believe its a good idea for all contractors to display hotline posters. It is integral to good internal controls. DoD Contractors can download the DoD-IG Hotline Poster here. The Contractor shall display prominently the DoD fraud, waste, and abuse hotline poster prepared by the DoD Office of the Inspector General, in effect at the time of contract award, in common work areas within business segments performing work under Department of Defense (DoD contracts. For contracts performed outside the United States, when security concerns can be appropriately demonstrated, the contracting officer may provide the contractor the option to publicize the program to contractor personnel in a manner other than public display of the poster, such as private employee written instructions and briefings. Additionally, if the Contractor maintains a company website as a method of providing information to employees, the Contractor shall display an electronic version of the poster(s) at the website (underscore added). The company website is an additive requirement, not an alternative requirement. The FAR clause does not apply to DoD contractors however. It is replaced by DFARS 252.203-7004 which contains no corresponding language pertaining to a company website. You may have had contracting officers tell you the company website is an acceptable alternative. That's probably incorrect guidance. So, get those hotline posters posted. Navy Tries to Reduce Fixed Contract Price after Work Completed - ASBCA Says "No"
In 2015, the Navy awarded a contract to HCS Inc to repair a leak in an 8" water line. After work began, it was discovered that the leak was in a 4" line that intersected the 8" line. Since the 4" line was no longer needed, the Navy instructed HCS to cap the 4" line, thus solving the leakage problem. After the work was completed, the Navy unilaterally reduced the contract price by about half because HCS, while solving the problem, didn't have to do as much work as initially contemplated by the contract. HCS didn't care for the Navy's action and appealed the unilateral price reduction to the ASBCA (Armed Services Board of Contract Appeals). The Board noted that under the Changes clause, the contract price must be equitably adjusted when a change in the contract work causes in increase or decrease in the cos of performance of the work. The purpose underlying an equitable adjustment is to safeguard both contractors and the government against the increased costs engendered by modifications adding or deleting contract work. However, in the case of a reduction, the government has the burden of proving the amount of cost savings due to the deletion of work. A contractor is entitled to receive its contract price unless the government demonstrates the government is entitled to a price reduction for deleted work. The Board stated that it was not aware of any authority allowing the Navy to delete work from a contract after work performance and then refuse to pay for the work initially specified and performed and so ruled that a contractor is entitled to receive its contract price where the government fails to demonstrate entitlement to a contract price reduction for deleted work.. The ASBCA ordered the Navy to pay HCS the full contract price plus interest. Click here to read the entire ASBCA decision. Be careful if the Government asks you to enter into a no-cost storage contract. It may cost you some money. We don't know how frequently the Government and contractors enter into no-cost storage contracts but often enough that there is a body of knowledge pertaining to no-cost storage contracts even though there is no mention of such contracting in the FAR (Federal Acquisition Regulations). Many no-cost storage contracts are for temporary storage of GFE (Government furnished equipment) or GFM (Government furnished materials) that may benefit a future contract. It could be special tooling or test equipment that the Government wants to keep around for future production runs. Contractors are often willing to enter into these no-cost contracts when space is not at a premium and can themselves, see a future need for whatever it is that the Government wants stored or warehoused. The problem here is that while the contract may not make provision for cost, there is a cost involved in storing Government equipment and these costs must be paid and then allocated to something - usually an indirect expense pool - which is then allocated to contracts that receive no benefit from such costs. Contract auditors will come along and question those costs as not allocable to other Government work. And, they're correct. They've got FAR 31.201-4, Determining Allocability behind them as well as CAS (Cost Accounting Standards) 402, Consistency in Allocating Costs Incurred for the Same Purpose. The likely result of any accounting treatment is that costs associated with the storage or warehousing are allocated to and reimbursed under other non-benefiting Government contracts. Irrespective of whether a contract provides for reimbursement of costs of particular items, the allocability of costs must be determined by the causal or beneficial relationship of the cost to the final cost objectives. Other contracts cannot bear the storage or warehousing costs that are properly allocable to no-cost storage contracts. When a contracting officer (or commercial customer) has requested a contractor to store property at no cost, the contract auditor, if the costs are either directly or indirectly charged to other Government contracts, will issue a notice of intent to disallow costs on impacted contracts. Do not be surprised if during an incurred cost audit, an auditor requests you to identify any no-cost storage contracts. Many times, the coy contract auditor already knows the answer. Most contractors doing business with the Federal Government are subject to the FAR Part 31 cost principles among which FAR 31.201-6 requires contractors to identify and exclude unallowable costs from any billing, claim, or proposal applicable to a Government contract. How contractors go about doing this varies widely. The most efficient way to identify and exclude unallowable costs is to make a determination at the time the expense is first recorded and drop it in the appropriate "bucket"; allowable or unallowable. That method assumes that (i) contractors have someone reasonably familiar with FAR Part 31 in their accounting departments to make those determinations and (ii) that their accounting systems are set up to record and segregate unallowable costs. More common among small contractors is the ritual of "scrubbing" records for potentially unallowable costs at the time a submission is made. So, for example, contractors submitting annual incurred cost submission will follow due diligence to identify and exclude unallowable costs from its indirect cost expense pools. Contract auditors, namely DCAA or Defense Contract Audit Agency, have, from time to time, taken the position that costs associated with scrubbing accounts to identify unallowable costs are unreasonable. They rationalize that the need for "scrubbing" is a direct result of "earlier negligence" in establishing, maintaining, and/or implementing adequate systems of internal controls to identify and exclude such costs at the time of original entry. Advancing that logic, since the cost of "scrubbing" is unreasonable and unreasonable costs are unallowable according to FAR 31.201-3, contract auditors should be questioning those costs. The idea here is that if contractors had done it right the first time (and the Government paid for that), there wouldn't have had to be a second time. The costs are not of a type generally recognized as ordinary and necessary for the conduct of the contractor's business or the performance of a contract. The costs are duplicative of costs incurred for the same purpose in prior periods. The Government has already reimbursed the contractor for the costs of preparing billings and claims for reimbursement. The fact that this task was not adequately accomplished does not entitle the contractor to additional reimbursement. The costs are the result of the contractor's failure to follow the requirements of generally accepted sound business practices and contract terms. In 2015, GSA (General Services Administration) issued a solicitation for "customized training and development services, customized human capital strategy services, and customized organizational performance improvement services". The solicitation contemplated multiple awards under an ID/IQ (indefinite-delivery, indefinite-quantity) arrangement where individual task orders would be issued. Awards were to be based on best value but to be eligible for consideration, offerors had to have performed at least six "relevant experience projects" (REPs). Further, offerors had to substantiate their relevant experience by providing sufficient evidence "within a verifiable contractual document" adding that credit would be given only if the Government could validate the information through a signed, certified and/or legally recognized document. Specifically excluded from the list of supporting evidence were CPARS (contractor performance assessment reporting system) reports which were deemed insufficient to substantiate the scope, period of performance, and dollar value of offeror's claimed experiences. Offerors were also advised that there would be no opportunities to resubmit relevant experience documentation. ABSG Consulting Inc. was one of 115 companies submitting proposals for this solicitation. ASBG's proposal included a copy of an "Order for Supplies and Services" that was unsigned by either ABSG or any government agency, along with a CPARS report to substantiate its claimed experience. GSA concluded that because the order was unsigned, it did not constitute sufficient evidence within a verifiable contractual document to substantiate ABSG's claimed experience. Further, since the solicitation specifically precluded reliance on CPARS reports, GSA eliminated ABSG's proposal from further consideration. ABSG appealed, asserting that the unsigned contract document and CPARS report should have been considered sufficient to meet the solicitation requirements and further asserted that GSA was obligated to validate ABSG's claimed experience by contacting the contracting officer or conducting a search for the contract in Government databases. GSA basically called that position nonsense and refereed back to the explicit language of the solicitation. The Comptroller General (CG) in hearing the appeal, sided with GSA. The CG found no basis to question the reasonableness of GSA's determination that ABSG's unsigned documentation and CPARS report were insufficient to meet the solicitation's experience requirements for substantiating prior experience. Since the solicitation expressly provided that an offeror's claimed experience must be substantiated by evidence "within a verifiable contractual document", the CG also rejected ABSG's argument that GSA should have gone out and performed its own validations. Seems to us like ABSG's arguments were weak from the outset. You can read the full text of the CG's decision here. Yesterday we discussed a contractor's lack of robust internal controls that allowed an employee to embezzle $1.3 million over a four year period. If you missed that post, you can read it here. Every company needs internal controls but small companies sometimes cannot afford to have comprehensive systems to guard against fraud, waste, and abuse. But there are things even the smallest company can afford. The following is an internal control/defalcation checklist adapted from a publication by the American Institute of Certified Public Accountants (AICPA) that independent independent accountants/auditors use to assess the adequacy of internal controls at companies of any size. Use it to self-assess how your company measures up. a. Is the person who handles cash also responsible for recording cash? b. Does the person who pays or orders inventory also receive materials? c. Are two or fewer people responsible for the accounting function? d. Is only one person responsible for reviewing financial statements each month? e. Is your review of financial journals sporadic? a. Do you reconcile the bank statement on a timely basis, at least once a month? b. Do you review any adjustments and verify reconciling items? c. Are reconciliations performed by one person and reviewed by another? d. Is the person who writes checks restricted from signatory authority? e. Do you review canceled checks and endorsements on a monthly basis? f. Do you compare payroll checks with your current employee records? g. Do you question funds transferred between bank accounts? h. Do you track the number of credit card bills you sign each month? a. Do you ever sign b lank checks? b. Do you ever sign checks without original supporting documentation? c. Have funds ever been transferred between accounts without review or verification? d. Do you ever sign checks for new business vendors without knowing or verifying their name and association with your company? a. Are any employees extremely possessive of their work records and reluctant to share their tasks? b. Are any employees apprehensive about taking a vacation and time off, and are also the first one in the office and the last one out? c. Have you notice a substantial change in the lifestyle of any employees? d. Do any of your employees have a possible substance abuse problem? e. Are any of your employees living beyond their means? f. Have you ever hired an employee without checking references? g. Do you permit accounting personnel to work longer than a year without taking a vacation? h. Do you have any accounting staff who has not been bonded? a. Are blank checks and signature stamps locked up? b. Do you restrictively endorse all checks? c. Do you deposit all cash and checks daily? d. Do you maintain a list of office furniture, equipment, and vehicles? e. Do you back up all computer files on a regular basis and store the backup in a remote location? f. Do you have password restrictions for your systems? g. Do you maintain adequate insurance coverage n all assets including business interruption insurance? How does your company compare? Remember, "trust" is not an internal control. Just a week ago, we reported on a case where a highly trusted contractor employee embezzled $825 thousand from his company by using a company issued credit card for personal expenses. Now we have another misuse of company credit card case being reported by the Department of Justice. This time, the perpetrator made $1.3 million in unauthorized personal charges to a company credit card. He has pleaded guilty and has agreed to pay restitution and when he appears for sentencing, faces additional fines and possibly prison time. This time however, the perpetrator was not someone in a trusted position in the company - he was a lowly accountant who got away with the embezzlement for four years. Cases like these should really be wake up calls for companies to examine their own company-issued credit card policies and related internal controls. As we all know, "trust" is not an internal control. In the most recent case (you can read DoJ's press release here), Mr. Bell got a job in the accounting department at Phoenix in 2008. Phoenix is a non-profit firm providing counseling for and placing people with disabilities in administrative, manufacturing, and custodial positions. One of Phoenix's Government contracts was valued at $20 per year providing custodial services at Redstone Arsenal. A year later, Bell began using a company-issued credit card for personal expenses until he was caught in 2013. By that time, he had racked up $1.3 million in personal expenses including nearly $100 thousand to Best Buy, $70 thousand to airlines, $70 thousand to hotels, and many other luxury goods and department stores. We wonder why no one ratted him out for living well beyond his apparent means in an accounting job. We're not quite sure how Bell covered his tracks - the DoJ press release didn't go into a lot of detail concerning the cover-up. "Bell deleted unauthorized purchases from the credit care monthly statements and manipulated Phoenix's account ledgers so that they would balance with the bank's spreadsheet that showed what Phoenix owed for its staff credit cards." The only way for this balancing act to have worked is if Bell increased the expenses related to other "legitimate" charges equal to the amounts he deleted for personal expenses. Along the way, Bell became more emboldened. He set up his own accounting firm and invoiced Phoenix for $300 thousand in accounting services never provided. Bell never reported this income either and now has IRS problems. The press release did not divulge how the embezzlement was discovered. Eventually, these embezzlement schemes are exposed even if it takes 15 years like one case in Washington State. The most basic control a company can implement in credit card programs is to ensure that staff responsible for reviewing and processing credit card transactions, does not themselves, have company-issued credit cards. This Guidebook addresses FAR 31.2 and other areas of cost audited. In this first edition of the guidebook, we have expanded what used to be included in Chapter 7 by adding 23 additional chapters to address FAR 31.2 cost principals that had not previously been included in CAM. Initially, many sections of the guidebook are a replica of what was in Chapter 7; however, we have rewritten and updated 13 areas of cost. We will be continuing to rewrite the other chapters in this guidebook and will publish them as completed. This new guide is definitely a work in process as many of the chapters state "This chapter is currently under construction. The cost covered by the guide are listed in alphabetical order rather than FAR Part 31 order which may be easier or more cumbersome to navigate depending upon your familiarity with FAR. It appears that each FAR cost principle is covered as well as many other types of costs not specifically covered in the FAR. We should note that this is intended to be guidance for the contract auditor and not the final word on what is allowable or not allowable. Many disputes have risen over DCAA's interpretation of FAR and the Government does not always prevail. You can access DCAA's new guidebook directly by clicking here. The Department of Labor's Wage and Hour Division issued the final rules on paid sick leave for Federal contractors. These new sick leave rules were based on the President's similarly titled Executive Order from September 2015. These new rules cover contracts subject to the Service Contracting Act (SCA) and the Davis-Bacon Act (DBA) as well as concessions contracts and a few other obscure types of contracting. Under the final rule, employees will accrue one hour of paid sick leave for every 30 hours worked on or in connection with a covered contract up to a maximum of seven days or 56 hours. For contractor employees not required to maintain time records, they are presumed to work a 40 hour workweek. Contractors that don't like this presumption have a few months to implement a timekeeping system. Contractors can provide employees with at least 56 hours of paid leave at the beginning of each accrual year or allow employees to accrue leave based on hours worked. The former option is probably easier to implement. The final rule provides that contractors may limit the amount of paid sick leave employees may accrue to 56 hours each year and must permit employees to carry over accrued, unused paid sick leave from one year to the next. However, the final rule also permits contractors to limit the amount of paid sick leave employees have accrued to 56 hours at any point in time. That's confusing because if a contractor grants 56 hours at the beginning of the accrual year, any carry-over would be lost because the amount would exceed 56 hours. We're sure clarification will be forthcoming on this issue. Contractors are required to reinstate employees' accrued, unused paid sick leave if the employees are rehired by the same contractor within 12 months after a job separation unless contractors provide payment to employees for accrued, unused paid sick leave upon separation. Contractors are not required to pay employees for accrued, unused paid sick leave at the time of job separation (i.e. cash out). If they do provide cash-out, they will not be required to reinstate unused leave. Sick leave may be used for all the usual reasons; illness, injury, medical condition, and obtaining diagnosis for self and/or family. Leave may be taken in increments of one hour and the only limitation is the number of hours accrued. Employees do not earn sick leave while taking sick leave. Requests to use sick leave must be made at least seven calendar days in advance where the need is foreseeable and in other cases, as soon as practicable. Most contractors will probably establish more lenient procedures for requesting sick leave. You can read a lot more on WHD's website. If you have an iPhone or or an iPad or if you have iTunes on your computer, you can now download a free copy of the FAR (Federal Acquisition Regulations) to read (oh boy!) or reference. GSA (General Services Administration) released an iBook version of FAR last week. If you have an Android device or use Kindle, you will have to wait a little while longer. Those versions are coming, GSA promised. The chief advantage of an iBook is its availability even when you are not wired to the internet or do not have wireless service. The Government's Contingency Contracting Corps who travel to disaster areas around the world to lead emergency response and rescue missions can now have FAR at their fingertips (assuming that they at least have a power source for charging their devices). Besides these "first responders", some agencies have employees in remote areas that do not have access to the internet. The Agriculture Department for example has many such employees. The FAR iBook has the same functionality that is built into every iBook. 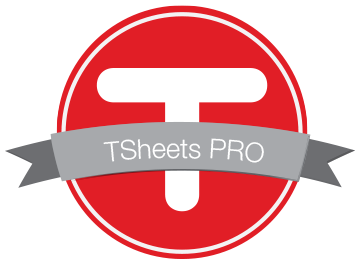 Readers can perform searches, write notes, and highlight or save the sections they use most often. Regulations change quite often so how will the FAR maintain it currency, once installed? iBook owners will receive a notification each time there's an update and new editions will automatically download the next time the particular device connects to the Internet. The FAR iBook is free and can be downloaded here. By the way, FAR has, for many years, been available as a .PDF file. It's huge and difficult to search or navigate but its also free and doesn't require "iBooks" to use. Download the .PDF file here. DCAA (Defense Contract Audit Agency) is now back in the business of performing audit services for non-DoD agencies. The Agency announced late last month that it had met the requirement imposed by the Fiscal Year 2016 National Defense Authorization Act (NDAA) of less than 18 months of incurred cost inventory and that the DoD Comptroller has certified DCAA's progress to Congress. For background on the 2016 NDAA restriction, click here. So, how did DCAA reduce its incurred cost backlog so quickly - in just one year? Primarily through establishing a risk-based approach to determining which contract fiscal year submissions required an audit and which could be administratively closed without undue risk to the Government. DCAA has informed its reimbursable customers that audit services can resume on October 1, 2016 and auditors are being instructed to likewise inform their respective reimbursable customers. Although some agencies have hired private firms for filling their contract audit needs (or are working toward that end), most agencies have not and will probably migrate back to DCAA. It will be interesting to see whether DCAA can now satisfy those customers and keep them as customers. Here's a fraud case that should prompt companies to review their own internal control systems for preventing employee fraud, waste, and abuse. Stuart Teshima, the former CFO of Epsilon Systems Solutions (a Government contractor headquartered in the San Diego area) pleaded guilty last Tuesday to embezzling $825 thousand from his company over an eight year period. He did this from his trusted positions of Vice President, Senior Vice President, and Chief Financial Officer of the company. How did he do it? According to the Department of Justice Press Release, Teshima used the company credit card to pay for personal expenses including airfare and other personal travel, jewelry, gifts for family members, furniture, lavish dinners, and even his personal income tax bill. Then, before submitting invoices for reimbursement, Teshima would conceal the personal spending by altering his account statements to replace the personal items with fictitious business expenses. He then falsely reported to company representatives that the statements he submitted were generated directly from his credit card account, when in fact he altered the records himself before submitting them for reimbursement. There are obvious internal control weaknesses in Epsilon's system. First of all, it appears that the company was paying its credit card balances without any support in the form of source documents. It merely relied on the signature of a trusted employee. Second, Epsilon was paying based on a "downloaded" statement which, of course, can be easily altered. It should have been paying based on printed statements received by mail that were reviewed and approved by a independent party. The independent reviewer should have insisted that charges be supported by original receipts. It should not be surprising that auditors (both financial auditors and contract auditors) ask for original source documents. They are not trying to be obnoxious but when they put their name on a report asserting that the financial representations fairly present the objective of their audit, they need to be certain, beyond a reasonable doubt, that the company's representations are not misleading (or worse). Epsilon has 1,000 employees and its not unlikely that with this many employees, there will be plenty of opportunities for those so bent, to poke around and find internal control weaknesses. Companies need to stay one step ahead of the fraudsters. Teshima pleaded guilty but has not been sentenced. He has agreed to pay restitution for the amount embezzled. In addition, he faces probable fines and possible imprisonment. For the past few days, we've been posting articles on FAR's fiscal year end regulation dump - prompted, no doubt, by someone's performance evaluation and bonus prospects (yes, Feds do get bonuses). So far, we've discussed the new regulations that cap compensation levels for contractor employees, the prohibition from taking reprisal action against any employee who may want to discuss or disclose their compensation, and prohibitions on contracting with tax deadbeats and felons. Today we will be discussing new regulations that may foretell a change in use of DUNS numbers - a unique nine digit identification number for each physical location of a business and a requirement for registering in SAM (System for Award Management). Currently, FAR uses a proprietary standard or numbering system to identify contractors - the Data Universal Numbering System (DUNS) number from Dun and Bradstreet. The new regulations eliminates all references to DUNS, the proprietary name, to a generic description, "unique entity identifier" or soon to be referred to as the UEI. Soon, the Government will embark on a process of exploring potential alternatives to the existing entity numbering systems - something that is not proprietary like the DUNS number. Although the Government is not currently in a position to move away from use of the DUNS number in the short term, elimination of regulatory references to the DUNS number will provide opportunities for future competition that can reduce costs to taxpayers. The current requirement limits competition by using a proprietary number and organization to meet the identification need as well as the need for other business information associated with that number. Unique entity identifier means a number or other identifier used to identify a specific commercial, nonprofit, or Government entity. See www.sam.gov for the designated entity for establishing unique entity identifiers. Right now, that designated entity is Dun and Bradstreet and its DUNS number. That could change and if it does, look for a lot of confusion during the transition. In our last two postings, we discussed last Friday's regulation dump where the FAR regulators presented us with a fiscal year-end gift. On Friday we discussed the prohibition against awarding contracts to companies with delinquent taxes or felony convictions. Yesterday we discussed the prohibition against retaliating against employees who share their compensation informtaion with one another. Today we take up the new regulation on contractor employee compensation caps. The new rule follows an interim rule from June 2014 that implements a provision in the Bipartisan Budget Act of 2013 that significantly reduces employees compensation that contractors and subcontractors can claim on Government contracts. 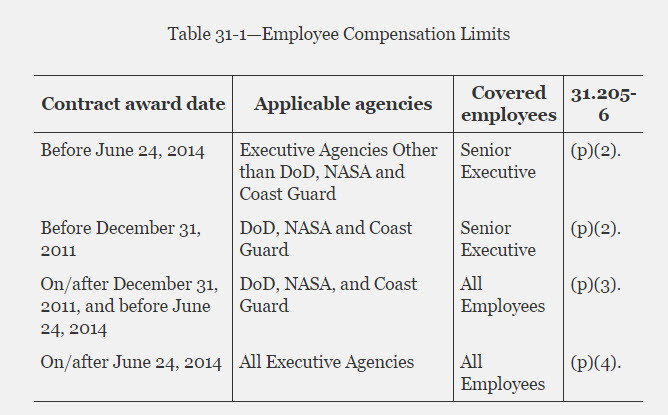 Compensation is capped on contracts awarded after June 24, 2014 to $487 thousand. Under the previous method for computing compensation caps, the maximum would have been (and still is for contracts awarded prior to that date) $1,144,888 for 2014 and lower amounts for earlier years. To view compensation caps by year under the old methodology, click here. The final rule doesn't make any substantial changes to the interim rule. 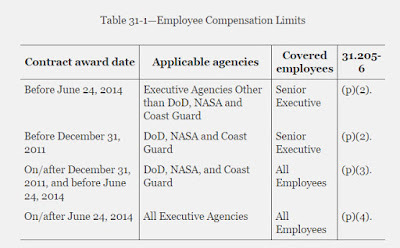 It adds the following table to help sort out which compensation caps apply to which agencies and which category of employees. The new rules provide an exception to the limitations. An agency head may establish one or more narrowly targeted exceptions for scientists, engineers, or other specialists upon a determination that such exceptions are needed to ensure that the executive agency has continued access to needed skills and capabilities. Those determinations must take into account the amount of taxpayer funded compensation to be received by each employee and the duties and services performed by each employee. We are not aware of any requests for exemptions however that is not to say that there may have been some. It seems to us the an Agency head would be reluctant to approve such requests without compelling evidence that it was necessary to attract and retain qualified employees. After all, $487 thousand is still pretty high compensation for scientists and engineers. Issuance of an interim rule allows for the requirements to be included in solicitations and contract immediately and puts contractors on clear notice of legal responsibilities that are already in effect. If the FAR rule is not issued ... this new requirement will not be incorporated into contracts, and contractors will be put at unnecessary risk of non-compliance with the E.O and labor rule. More importantly, this may unnecessarily delay action by contractors in providing the important protections for contract employees that the E.O. and labor rule are designed to provide. The new rule prohibits contractors (and subcontractors) from discharging, or in any other manner discriminating against, any employee or applicant for employment because the employee or applicant inquired about, discussed, or disclosed the compensation of the employee or applicant or another employee or applicant. This prohibition against discrimination does not apply to instances in which an employee who has access to compensation information of other employees or applicants as part of such employee's essential job functions discloses the compensation of such other employees or applicants to individuals who do not otherwise have access to such information, unless such disclosure is in response to a formal complaint or charge, in furtherance of an investigation, proceeding, hearing, or action, including an investigation conducted by the employer, or is consistent with the contractor's legal duty to furnish information. So now, employees may chatter freely about the compensation levels without fear of reprisal. A quick internet search didn't show any cases of reprisals against employees who disclosed their compensation information but, by golly, we now have a regulation in place - just in case it ever happens.